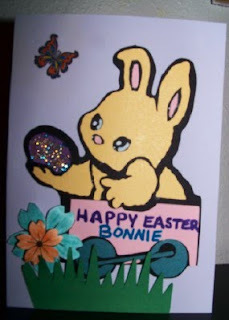 I made this for my Granddaughter Bonnie for Easter. The bunny in the wagon is from Mommy Mel's Addiction. Melanie thanks so much for sharing this file! I used some yellow and blue stickles on the egg, two cuts of the grass (layered them one on top of the other and put the wheel of the wagon in between them), added a double layered flower that is curled and dimensional and stamped and colored a butterfly in the corner. I am playing with embossing powder and a heat tool so this card got a little of everything LOL. Thanks Kathy - you did a great card with this file. Love when people can use my files! I am sure your granddaughter will love this card!